Every four years, the American election has a big impact on Canada. But if Canada were the 51st state in the union, it would have a big impact on the American election. Polls have long showed Canadians expressing greater support for Democrats than Republicans. One recent survey gave President Barack Obama an approval rating of 80 per cent among Canadians, a score he has not managed south of the border since the first months of his presidency in 2009. Nowhere in the country would Trump be considered even a competitive candidate. His best score in the Abacus poll came in Alberta, where just 26 per cent of voters would support him. Trump is deeply unpopular in Canada. The Mainstreet survey gave him a favourability rating of just 15 per cent, with 75 per cent of Canadians saying they hold an unfavourable view of the Republican nominee. Clinton, on the other hand, scored a favourability rating of 62 per cent, against 24 per cent unfavourable. Clinton would love to have those numbers in the United States. 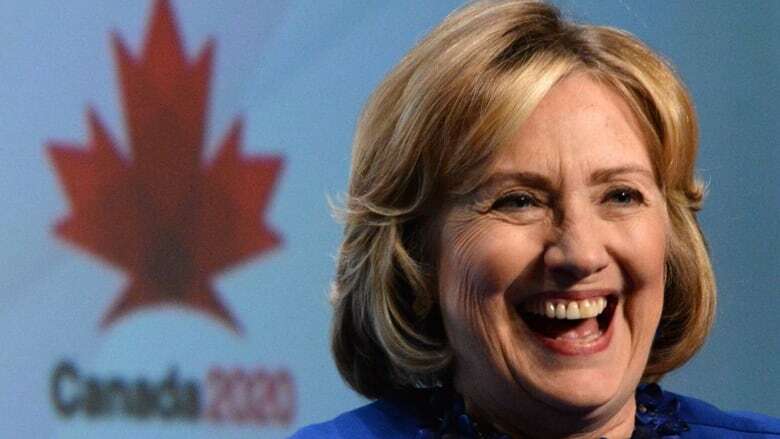 Recent polls suggest that anywhere from 50 to 60 per cent of Americans hold an unfavourable view of her. If Canada were a U.S. state, it would carry an enormous weight in the electoral college, as well as in the base of the Democratic Party. Not since 1964 have the Democrats won a state with at least 80 per cent of the vote (though the party routinely wins Washington, D.C., with well over that level of support). The electoral college, which decides U.S. elections, awards each state in the union a number of votes equal to the size of its representation in Congress. Each state has two senators, as well as a number of members of the House of Representatives, which is based on population. 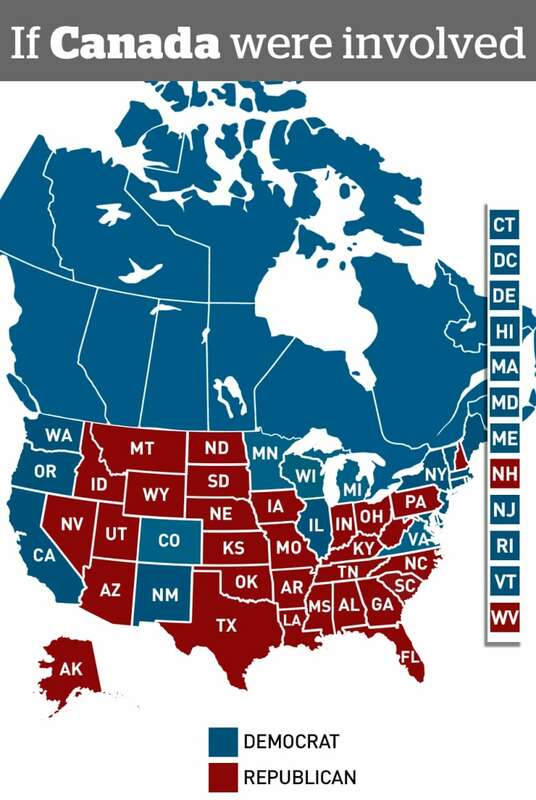 Even if Donald Trump won all of the swing states (as above), Hillary Clinton would still win the election — if Canada was the 51st state. (CBC News)If Canada were the 51st state, it would have enough electoral college votes to put it somewhere between California and Texas. And with Clinton taking around 80 per cent of the vote, Canada would be the most reliably blue state in the union. The impact of adding another California (considering how reliably Democratic that state also is) to the electoral map would be significant for the Democrats. Trump could win all of the states that Mitt Romney captured in 2012 as well as the swing states of Florida, Ohio, Pennsylvania, Iowa, Nevada, and New Hampshire, and still lose the electoral college vote. That would be the equivalent of Trump beating Clinton in the popular vote by more than three percentage points south of the border, and still losing the election. Canada's votes alone would be enough to make up the difference. Unfortunately for the Democrats, Canada doesn't seem to be in any rush for an ever greater union in North America. Instead, considering his unpopularity in this country, Canadians might support building a border wall of their own if Trump does becomes the next president of the United States. It's unlikely, though, that we'd get Trump to pay for it. The poll by Abacus Data was conducted between May 17 and 20, 2016, interviewing 2,000 adult Canadians via the internet. A probabilistic sample of this size would yield a margin of error of 2.2 per cent, 19 times out of 20. The poll by Mainstreet Research was conducted between June 25 and 26, 2016, interviewing 2,076 adult Canadians via interactive voice response. A probabilistic sample of this size would yield a margin of error of 2.2 per cent, 19 times out of 20.